Food/Type of allergen:Daul et al. (1987) , Daul et al. (1988) , Morgan et al. (1989)  and Morgan et al. 1989  made a water soluble shrimp extract by boiling white shrimps (Litopenaeus setiferus) in deionized water for 15 minutes. Shrimp meat was removed from the shell, degutted and homogenized in PBS, pH 7.2 in a blender. The slurry was shaken overnight at 4°C and centrifuged at 27,500g. The supernatant was concentrated with an Amicon YM5 (cutoff >5000 Da), centrifuged at 105,000g and dialysed against PBS. Extracts were sterile filtered with a 0.45 µm membrane and were tested and found negative for hepatis B surface antigen. Morgan et al. 1989  also used a similar extract of brown shrimp, Farfantepenaeus aztecus. Protocol: (controls, definition of positive etc)Daul et al. (1988)  used increasing concentrations of allergen (1µg/ml to 10 mg/ml) to find a positive response defined as a mean wheal diameter 3 mm greater than that from the PBS/glycerol (50% v/v) control. Number of Patients:Daul et al. (1987)  tested 33 patients with a history of shrimp allergy and 29 controls. Daul et al. (1988)  tested 30 patients. Morgan et al. (1989)  tested 60 patients of whom 36 had a history of shrimp allergy. Morgan et al. (1989)  tested 30 shrimp allergic patients with both white and brown shrimp extracts. Summary of Results:Daul et al. (1987)  reported that 28/33 shrimp-sensitive subjects had positive skin prick tests to shrimp extract, whereas skin tests were negative in 27/29 control subjects. Daul et al. (1988)  reported 23/30 positive SPT results and 7/30 negative. The oral challenges on these patients associated all but a single open challenge result with the positive SPTs. Morgan et al. (1989)  reported that there was a higher incidence of SPT reactivity to shrimp extract in patients who reported pulmonary symptoms compared to patients without pulmonary symptoms (86% vs. 55%). Morgan et al. (1989)  found that 6/30 were negative to both white and brown shrimp extracts, 23/30 were positive for both extracts and a single patient was positive only for brown shrimp. Lehrer et al. (1990)  made a water soluble shrimp extract by boiling white shrimps (Litopenaeus setiferus) in deionized water for 15 minutes. Shrimp meat was removed from the shell, degutted and homogenized in PBS, pH 7.2 for 3 min. in a blender. The slurry was shaken overnight at 4°C and centrifuged at 44,000g. The supernatant was concentrated with an Amicon YM2 (cutoff >1000 Da), dialysed with a 3.5 kDa cutoff against PBS and centrifuged at 78,000g. The supernatant was then aliquoted and stored at -20°C. The water from the initial boiling was also concentrated with a YM2, dialysed against water, centrifuged, freeze dried and stored at -20°C. Daul et al. (1987) , Daul et al. (1988) , Morgan et al. (1989)  and Morgan et al. 1989  used the extract of boiled white shrimp described for SPT. Morgan et al. 1989  also used a similar extract of brown shrimp, Farfantepenaeus aztecus. Daul et al. (1987)  and Daul et al. (1988)  used RAST for IgE and ELISA for IgG, IgA and IgM. Morgan et al. 1989  and Lehrer et al. (1990)  used RAST and RAST inhibition. Daul et al. (1988)  tested sera from 30 patients who were also subjected to oral challenge. Morgan et al. 1989  tested sera from 31 shrimp allergic patients and 13 atopic shrimp tolerant controls. Lehrer et al. (1990)  tested sera from 14 shrimp allergic patients and 6 atopic shrimp tolerant controls. Daul et al. (1988)  reported a good correlation between shrimp RAST and both SPT reactions and response to oral challenge. The combination of a positive SPT to shrimp and >11% bound in shrimp RAST had a 87% positive predictive value. Np correlation of IgG, IgA or IgM levels with challenge responses was observed. Morgan et al. 1989  reported that 16/31 patients had positive RAST to both brown and white shrimp, one was only positive to white shrimp and 2 only to brown shrimp extract. None of the sera from SPT negative patients gave a positive RAST. RAST Inhibition studies of 7 sera with high RASTs showed that 2 showed qualitatively different allergens between white and brown shrimp. Lehrer et al. (1990)  report significant specific anti-shrimp meat and shrimp water IgE from all 14 sera from allergic patients with low binding from control sera. Shrimp meat and shrimp water extacts could inhibit each other to at least 50%. Daul et al. (1990)  reported that specific anti-shrimp IgE was maintained in the 7 DBPCFC positive patients tested over at least 24 months. Immunoblotting separation:Lehrer et al. (1990)  separated shrimp allergens by isoelectric focusing in thin 5% polyacrylamide gels (LKB PAG plates, Bromma, Sweeden) with a pH range 4.0 to 6.5. Lehrer et al. (1990)  cut the gel and fixed half in 11.5% trichloracetic acid and 3.5% sulfosalicylic acid, before staining with Coomassie brilliant blue in 20% methanol and 8% acetic acid. The other half of the gel was blotted by passive transfer onto a 0.2µm pore nitrocellulose membrane. This was blocked for 1 hour with 0.05M phosphate buffer, pH 7.5, with 1% (w/v) bovine serum albumin and 0.4% (v/v) Tween 20. The strips were incubated with human sera, washed with phosphate/Tween buffer and incubated overnight in 125I-labelled equine anti-human IgE diluted with blocking buffer. After washing, IgE binding was revealed by autoradiography at -70°C for 48 hours. Immunoblotting results:Lehrer et al. (1990)  reported that 86% of the 14 sera reacted with allergens with pIs from 5.5 to 6.0. The 12 individual sera showed from 3 to 7 bands in this region. 8 0f these sera reacted to proteins focusing between pH 4.5 and 5.0 (57.5%) and 9 (64.3%) reacted to proteins focusing between pH 5.0 and 5.5. Only 4/12 sera bound proteins focusing below pH 4.5. 2/14 sera did not show any binding in the blot. A water soluble shrimp extract was made by boiling white shrimps (Litopenaeus setiferus) in deionized water for 15 minutes. Shrimp meat was removed from the shell, degutted and ground in 0.1M PBS, pH 7.2. The slurry was stirred overnight at 4°C and centrifuged at 27,500g. The supernatant was concentrated with an Amicon YM5 (cutoff 5 kDa) and centrifuged at 105,000g. The supernatant was then dialysed against PBS, aliquoted and stored at -20°C. The extract was disguised in a grape flavoured vanilla ice-cream milkshake. Increasing doses of 1, 4 and 16 shrimp equivalents were given at 1hr. intervals. The open challenge was 16 shrimps (approx. 64 g.) (Daul et al. 1988 ). Blind:Double blind challenge followed by open challenge if negative (Daul et al. 1988 ). 30 patients were challenged by Daul et al. (1988)  with clinical histories of oropharyngeal pruritus (90%), urticaria (61%), angioedema (52%), wheezing (42%), gastero-intestinal symptoms (35%) and anaphylaxis (10%). Atkins et al. (1985)  reported 4 positive challenges with shrimp. Stricker et al. (1986)  reported a single positive challenge with shrimp. Rance & Dutau (1997)  reported 4 positive challenges with shrimp. Osterballe et al (2005)  reported 3 positive challenges with shrimp. Daul et al. (1988)  reported that 9/30 patients gave a positive challenge with objective symptoms. 6 of these reacted to the blind challenge and 3 to the open challenge. All reactions occurred within 1hr. and all but 2 (persistant vomiting and wheezing) resolved without treatment. 12 reacted only with subjective symptoms of oropharyngeal pruritus. All DBPCFC positive patients also complained of subjective symptoms at lower doses. 9 patients did not respond to the challenge. As mentioned above, Morgan et al. (1989)  report that 1/16 subjects reacted only to white shrimp (Litopenaeus setiferus) extracts and 2/16 subjects to brown shrimp (Farfantepenaeus aztecus) extract alone. Greater differences might be predicted for less closely related crustacea. There is also IgE cross-reactivity between crustacea and insects, gastropods, bivalves and cephalopods (Lehrer & McCants, 1985 ; van Ree et al, 1996 ; Leung et al, 1999 ; Goetz & Whisman, 2000 ). This is believed to be due to allergenic tropomyosins. Fernandez et al. (2003)  demonstrated IgE binding and SPT reactivity to shrimp in subjects sensitised by insect and mite allergens without prior exposure to shrimp. In contrast to the observed cross-reactivity in IgE binding between arthropods and mollusks, clinical cross-reactivity is less common and some but not all crustacea allergics can tolerate mollusks (Leung et al, 1996 ; Ishiwara et al., 1998 ; Ishiwara et al., 1998 ). 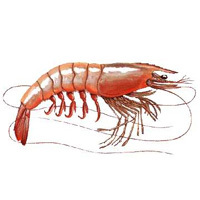 Although many articles described allergy to white shrimp in the period 1985-1990, subsequent research has characterized molecular allergens from other shrimps, including the greasyback shrimp, Metapenaeus ensis and the brown shrimp, Farfantepenaeus aztecus. As the allergens are likely to be similar, data on other shrimps is relevant to this entry. As the species is often unspecified, data on "shrimps" is often repeated in several entries. Daul CB, Morgan JE, Lehrer SB. The natural history of shrimp hypersensitivity.